Thanks so much for doing this, Mike. A real labor of love. I wish I could add name suggestions but I can’t. You’ve done a magnificent job! I’m so glad you’re doing this. Are you going down to the level of individual trees like the old map? Great that you’re getting input, but since you’re doing the work I think you’re entitled to some naming rights. It’ll be interesting to see if different communities of users have different names. Hi Graham, yes I have all but a couple of the trees identified and they are named on the map. Check the map link on the front page of the site. So far, I’ve been asking people since 2011 what the various areas are called, and most of them have not been given names. I’ve gotten a couple of suggestions that I might follow, I’m hoping for more. Id like to see some trees named in honor of some of the children and people that died on the general Slocum . They were going to have a day off and a picnic but because of people being selfish and greedy they lost their lives . The monument near the peaceful grove is in honor of them. ……… : “The crew distributed life jackets, but they too were rotten. Boats sped to the scene and pulled a few passengers to safety, but mostly they encountered bodies “……………………….http://www.smithsonianmag.com/history/a-spectacle-of-horror-the-burning-of-the-general-slocum-104712974/?no-ist.. It would be nice if these people had their time but since they cant maybe in honoring them we can remind ourselves the cost of selfishness and greed and avoid it ! Hi RevChas, I’m looking for names that have some established history or are uniquely descriptive of the areas. I don’t think giving them the names of the victims of this tragedy would really stick in the minds of people or ever be generally used. But if you would like to write up a memorial about the Slocum disaster and the victims, I’d be glad to post it on the blog. A couple of days ago, while in the park, we placed an emergency call to the police to report a crime in progress. We were shocked by the operators lack of ability to geographically locate areas of the park. However, she did ask us whether we could tell her if the crime was near “Playground A” or “Playground B”, apparently existing names on a map she was looking at. Though very unromantic, playground names that reference the street they are closest to, could enhance park safety and the police departments ability to provide the fastest response, especially if the playgrounds had identifying signage. 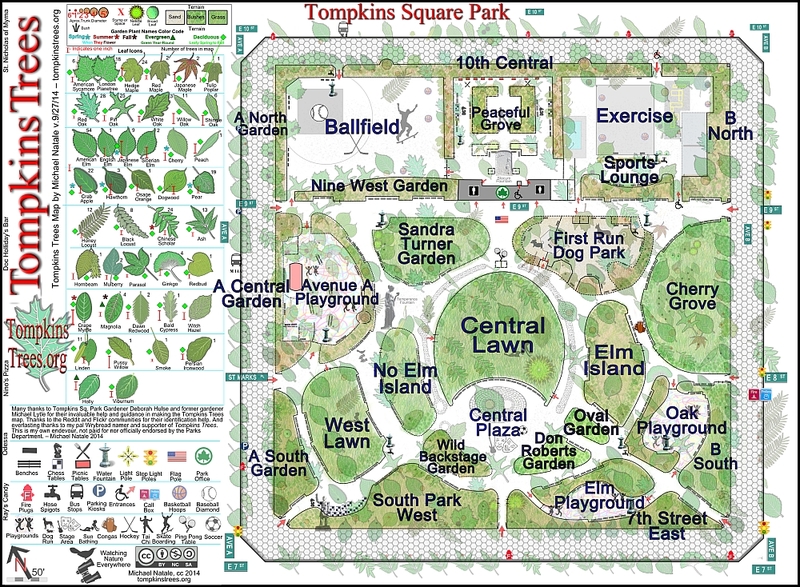 Therefore I propose the Avenue B Oak Playground and the 7th Street Elm Playground. It would be wonderful if emergency operators were able to access your map and the given names were signed and fell into common usage. Thank you for your fantastic project! That’s a sensible suggestion. Thank you. May I suggest that the monkey bars between the courts be called “The ParKour” since, being the most complex monkey bars in the city, it attracts parkourists from all five boroughs and is internationally known through many youtube videos? Also it would be a cool name and would record an interesting history for future generations. The 9th Street walk through should have a name too. I’d like to call the 9th Street pass “The Little Bowery.” Also the South West corner used to be the Slavic corner and still has the Paderewski tree and its plaque. That’s an important history and could be recorded in the map as “The Slavic Corner” or “The Slavic Chess Boards” or “The Paderewski Chess” or some such. Thanks for your beautiful work, Michael! Hi Rob, all useful input, thanks. The Paderewski Red Oak was recently cut down, very sad. I’ve indicated parkour for the monkey bars on more detailed versions of the map, I’ll make sure to do it again. I should indicate the rubberized areas as well. Each basketball hoop is indicated with an icon. I’d call it the Exercise Yard, but that sounds too much like prison. The handball courts will be indicated on the map, these names are just the general areas, but people could indicate where they want to meet with compass point directions. Hi Rob, I’ll look for the new hoop and add it.